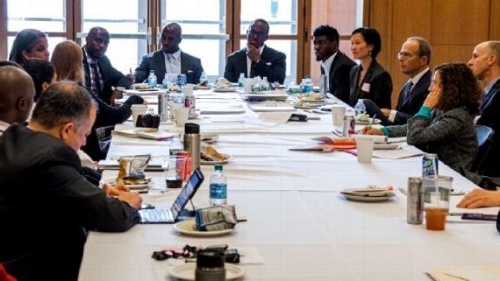 Last Friday, Patriots players Duron Harmon, Devin McCourty, Matthew Slater and Johnson Bademosi and president Jonathan Kraft joined YAF, CPCS, and other criminal justice advocates for a day of discussing elements of the criminal justice system in Massachusetts at Harvard Law School. Panels covered topics from the socioeconomic realities of minority populations in MA and the role of ineffective education and welfare systems, particularly in pushing kids out of school and into the justice system; to the factors that lead to youth involvement in the juvenile justice system, and alternative approaches to locking kids up; to the failure of Massachusetts to adequately address both pre-arrest and post-release failures on a systemic level and possible solutions. The group also traveled to Haley House where they learned about the dynamic community and social change organization and met with former and current individuals involved with some of the many projects and initiatives of Haley House. Criminal justice advocates and experts included: Joshua Dohan of YAF and CPCS; Samantha Calero, of YAF; Marlies Spanjaard of YAF and CPCS; Jacob Sussman of the Fair Punishment Project; Rahsaan Hall of the ACLU of MA; Jeremy Thompson, of the Madison Park Development Corporation; Judge Gloria Tan of the Middlesex County Juvenile Court; Duci Goncalves of CPCS; Mia Alvarado of Roxbury Youthworks; Andrea Perry of YouthConnect; Sana Fadel of Citizens for Juvenile Justice; Dehlia Umunna of Harvard Law School; Councilor Andrea Campbell of the Boston City Counsel; Randy Gioia of CPCS; Patricia Garin of the Prisoner's Assistance Project at Northeastern; Jerome Pitts of Haley House; Anthony Benedetti of CPCS; Lisa Hewitt of CPCS; Nancy Bennett of CPCS; Lael Chester and Yohanna Beyene of the Justice Lab at Columbia University; Luther Pinckney of Haley House (formerly); Priscilla Duffy of CPCS. Thank you to all who participated and engaged in these thoughtful discussions! Screening to be followed by a panel discussion* about education inequities in Massachusetts. YAF's 17th Annual Spring Celebration is only three months away! Look out for more information coming soon!